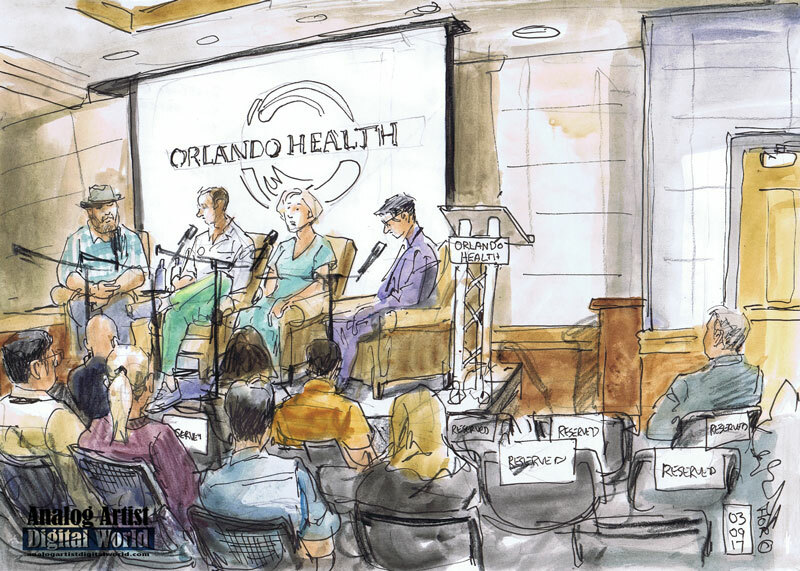 Orlando Regional Medical Center (ORMC), the hospital that treated most of the Pulse survivors, hosted a Pulse town hall meeting at the hospital just a few blocks north of Pulse. I had to ask the valet which building the meeting was in and he pointed me in the right direction. The entry had a metal detector so I had to empty my pockets and assure the guard that pencils are not weapons. The way to the meeting room was long and winding. I was a bit late, since I had rushed to the hospital after teaching a class. As I slipped in the Town Hall meeting was already underway. WMFE’s Matthew Peddie spoke with survivors, first responders, city officials and LGBT/Latinx community leaders.The first panelists were Christopher Hanson who was in the club and survived, Dr. Joshua Corsa, Orlando Health, who wrote the viral post about his blood-soaked shoes, and Nurse Emily Brown, of Orlando Health. Christopher Hanson was asked about his experience on the evening of June 12, and he briefly described his night. I have heard two interviews and was amazed at how brief he kept his account. Nurse Emily Brown, described her evening if hiding when reports surfaced that there might be a shooter in the hospital. She had been told that things were about to get crazy and then 36 patients arrived in the first 36 minuted. There was no time to think. Dr. Joshua Corsa was asked about his sneakers. He worked for 30 hours straight trying to save lives and when he finally had a moment to reflect, he realized his brand new sneakers were blood soaked. He wore that same pair of sneakers every day until the last survivor left the hospital. Orlando Mayor Buddy Dyer and Orlando Police Department Chief John Mina were the next people on stage. Speaking about a future memorial, Buddy pointed out that the community process is in some ways more important than the final creation. Everyone should have input into the process.A sculptor submitted a sculpture honoring the Pulse victims but the mayor said that it wasn't his place to decide what art is appropriate.An audience member stood and asked about what measures are being taken to keep undocumented LGBT survivors safe from being deported if they turn to authorities for help. Chief Mina pointed out that Orlando police have never been involved in deportation. It isn't their job. Seattle began a program called the Safe Place Initiative which puts rainbow stickers on businesses that support different cultures and diversity. That program will be implemented in Orlando. A woman from the audience stood up to the mic and spoke of the fierce love that came from our city government. Our community experienced a strong commitment to love and that message remains strong today. The final panelists were Christopher Cuevas, Executive Director of QLatinx and Terry DeCarlo, Executive Director of GLBT Community Center of Central Florida. Christopher feels that people are still struggling in isolation. "Thousands of voices need to be echoed from the mountain tops." he said. Terry was outraged by the media's insistence that the 911 tapes be aired on TV. He also hated the video reenactment that was created recently. He warned as many people as he could, but a mom was making dinner in the kit hen and overheard her son on a 911 tape. That level of emotional damage is irreparable. He wished that the media could instead celebrate the lives lost, and share the stories of heros. He was thankful to those who bear witness. 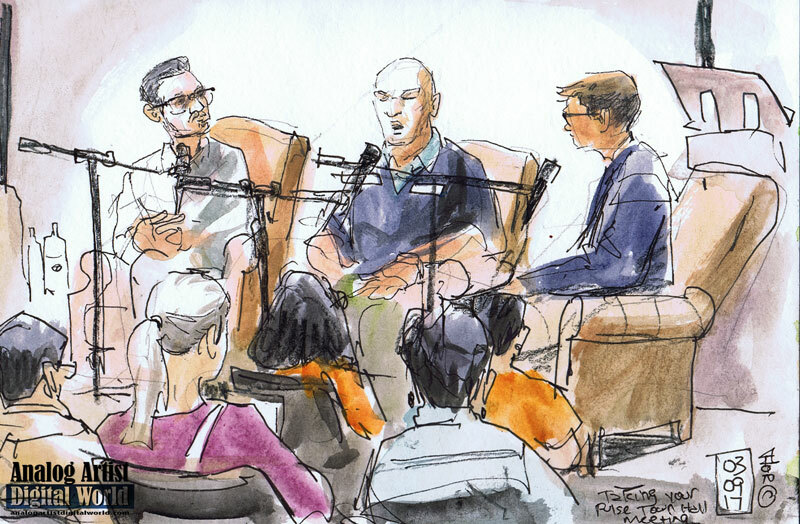 The evening was part of Story Corps: Taking Your Pulse project and the first of a series of Dare to Listen events held in the community on tough topics in 2017. The long sterile hospital hallways felt strangely ominous as I navigated the maze back towards my car.